To celebrate their loyalty card scheme Nando’s are giving their customers the chance to dine for free. Fans of the Portuguese chicken restaurant need only to find and tear down giant loyalty cards from billboards springing up across the UK. 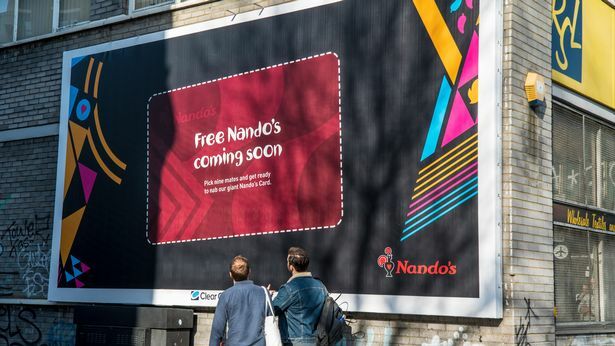 Across the next four weeks Peri Peri fans in London and Manchester could win 10 free meals if they manage to find one of the company’s hidden billboards and pull down an enormous 3×2 metre loyalty card. The chicken giant has already released several locations, but encourages their (hungry) customers to stay tuned to their social channels for the best chance of finding a billboard for themselves. For those outside of Manchester and London, rewards can also be found on peel-able loyalty cards attached to billboards in Birmingham, Sheffield, Cardiff, Glasgow and Bristol. The campaign springs from the revelation that there are 1.8 million rewards lying unclaimed on Nando’s loyalty cards. With these billboards then, Nando’s seems to be reminding customers that the key to free food could already be in your pocket.